Meet Kevin Clash, the man behind the Muppet and the unassuming heart and soul of Elmo. At last, the puppeteer who has performed Elmo for nearly twenty years comes out from behind the stage to share his story. Weaving together his memories of growing up with the life lessons gained from his furry red alter ego, Kevin reveals himself to be as caring, and as eager to grow and learn and love, as the very special character he brings to life. You will discover how young Kevin honed his talent entertaining the kids in his mother's home day care with puppets he made from slippers and coat liners; how, as a struggling young artist, he realized his dream to meet and then work for his idol, Muppet creator Jim Henson; and how each and every day of performing Elmo reinforces for him what is most important in life. 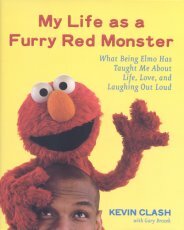 As Kevin has been inspired by Elmo, now we can all learn from his furry red ways. Kevin's (and Elmo's) thoughts on love, creativity, friendship, and optimism remind us of life's simple truths and ultimately encourage us all to be a little bit more like Elmo -- to live with joy, to love more easily, and to laugh more often.